This is the time of year I electronically dust off the addresses of friends and acquaintances, old and new, and ask myself over a cup of hot chocolate, “Do they still live there? How much is postage these days? Do I even know how to write something that isn’t my signature? This is to overwhelming. Maybe I’ll do it next year.” This is also where we’d have a picture of our family in front of a christmas tree showing how big Kara has grown and with a message about how great this year has been. Fortunately, our lives have been so blessed that one picture couldn’t possibly summarize everything that we’ve experienced this year. So, I present to you this e-essay/card where you can click on links so we both reminisce on what’s happened to the Falgout Family in 2011. Early on, I reconnected with my family through my long forgotten Falgout family tradition of a bonfire on NYE, as well as celebrating Kara’s birthday in our new Falgout family tradition: Cupcakes! We also got to meet Kara’s namesake celebrity, Katee Sackhoff. And a few other celebrities! Kathy and I also had a joint birthday celebration which resulted in the best surprise of my 35 years on this planet and an amazing party. But that’s not to say life doesn’t have its falls, with screams of laughter, fear and excitement. In fact, one of my favorite accomplishments of the year was the Trebuchet Contest. Which also had it’s own falls, laughter, fear and excitement. Somewhere mixed in all this was a trip to Italy, which I had promised Kathy for many years. And we discovered that even thousands of miles away, international cultures have more in common than you think. For the first time, since moving into the Plano, we participated in Halloween. Verdict: Cute! 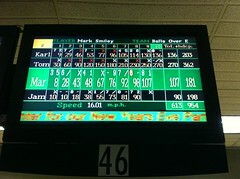 I also picked up bowling, which I found out I can be quite good at if I put my mind to it (read: Don’t drink as much). And who in Dallas could forget the Mavericks finally winning the NBA Championship! Looking back, it’s amazing to see all that has happened this year. It’s an extremely blessed and fortunate life. And it’s enriched by all of our friends and family which support and encourage us and our wacky lifestyle. Thanks and here’s to outliving the Mayan’s expiration in 2012!